A well used family favorite that's pet friendly and in the village! 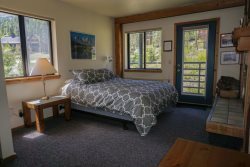 This is a popular choice many families because of its single level spread and stellar views of Kirkwood Meadow that are dependent on the snow level. The open floor plan is perfect for entertaining and mingling with family and friends. When it’s time to wind down, curl up next to the fire with a good book, and enjoy the silence of snow falling outside. This condo is great for larger families and groups of up to eight guests. Bring your furry friends and enjoy being so close to all Kirkwood has to offer. You won't need your car your entire stay. In the living room there is a large wood burning fireplace to cuddle up around and a separate area with a trundle bed that almost acts like a 3rd bedroom or loft. The bedrooms each have a queen/double bed and there are 2 full bathrooms. Even though this home is not updated, it's the owner's work in progress which is why it makes a great spot for pets and children! Sun Meadows is situated at the heart of the action, set between the Village Plaza chair lifts and Kirkwood Meadow. Four separate buildings comprise the Sun Meadows complex, each housing a variety of individually owned residences. Sun Meadows One is home to Expedition:Kirkwood and Cornice Grill; Sun Meadows Two provides spectacular views of Red Cliffs and the meadow; and Sun Meadows Three and Four are a stone’s throw from the Cornice Express and Solitude chair lifts.The Village Plaza is directly across the street from this complex, putting you in convenient proximity to all the resort has to offer. Dining, shopping, and equipment rental services are all just steps away. The Cornice Grill, featuring pub food and a full bar (seasonal), is located within your complex, giving you yet another option for an easy meal out or an après ski cocktail. A resort shuttle stops in front of the complex, making the trip to the Timber Creek base a breeze. - 2nd Guest Bedroom - One Double Bed and One Queen Bed. - Sun-Living Room - Single Trundle Bed. TV with Cable, DVD player and VCR. Excellent! Only thing would be more cleaning suplplies And vacuumed. I think it was in owners closet. Also access to washer and dryer would have been good. We were there for several days and assumed that wed have that. MANAGER RESPONSE: We will make supplies and vacuum available. We do note in the listing that a washer/dryer are not included. Friendly and efficient, the perfect combo. Disappointed in the condition of the property. MANAGER RESPONSE: We are working to get this property updated, but do rent it as a moderate property and is priced as such.